This is a most beautiful area of Turkey with an awe inspiring coastline. The small town of Dalyan has a wondeful location on a river which connects a large inland lake to the Mediterranean Sea. Iztusu Beach has just been voted the sixth best beach in the world and offers 5km of white sand and very safe swimming and no crowds. This is a conservation area so there are no beach front developments. The beach is reached by boat or by dolmus. The people are utterly charming and welcome visitors to their town of which they are very proud. This is an excellent location for families particularly those with young teenagers keen to spread their wings as it is a very safe location which does not attract the large groups of young people seeking clubs and alcohol. There are numerous excellent restaurants serving both Turkish and international cuisine. For those seeking either an activity holiday or a peaceful do nothing stay this is an exceptional location. A car is not essential although one can be easily rented in the town. There are four excellent mountain bikes in the villa for use by visitors. What does Villa Baykus have to offer? 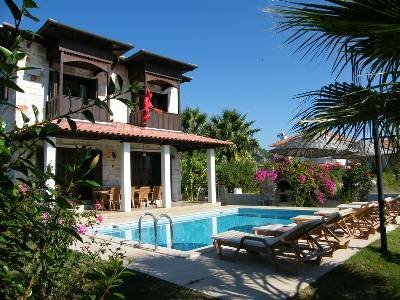 Villa Baykus is a beautiful newly built stone villa within 10 minutes walking distance of the centre of Dalyan. It has a very quiet location. There are three air conditioned bedrooms all with en suite facilities. Two rooms upstairs are double bedded rooms with balconies overlooking the pool and mountains beyond. Downstairs is a large bedroom with a double bed, a single bed and a large bed settee. The fully air conditioned open plan lounge, kitchen and dining area is very spacious. The open fire gives a focal point for the room. There is ample seating for watching television. The kitchen is very well equipped with all appliances including oven, dishwasher, washer and microwave. The open plan living area is joined to the covered terrace by twin sliding doors that give a feeling of being inside and outside at the same time. Outside there is a large private pool with ample sunbathing space and sun beds, barbecue and pleasant gardens with panoramic views of the surrounding mountains. In one corner is a Cardak which is a raised covered wooden structure furnished with large cushions. This is an ideal place to read, or relax with a drink and watch the sun go down at the end of another perfect day in paradise. All linen and bath towels are provided but guests are expected to bring their own beach and pool towels. The Villa has a cleaning service which cleans the villa each week and changes bed linen. At an approximate cost of £30 each way, transfers from Dalaman International Airport can be arranged.